To receive email from Jody Cull, add jcull@bolchazy.com to your safe sender list. Keep your "classics eye" on the lookout for items to include in future issues of eLitterae. Carpe imaginem—snap a photo with your cellphone and zap the photo and a little 411 to don@bolchazy.com. Editor Laurel Draper snapped this photo in Galena, Illinois. "Teaching venalicius in the Age of #MeToo" Panel includes Ronnie Ancona (Hunter College, CUNY Graduate Center, NYC), author: Writing Passion: A Catullus Reader, Writing Passion Plus: A Catullus Reader Supplement, Horace: Selected Odes and Satire 1.9; coauthor: Horace: A LEGAMUS Transitional Reader and A Horace Workbook. "The Romans No One Sees" Rose Williams (McMurry University, Abilene, TX) author: Latin of New Spain, Julius Caesar: Master of Surprise, A Beginning Christian Latin Reader: De Bonis Cogitationibus, Caesar's Blood: Greek Tragedy in Roman Life, and many others; coauthor Caesar: A LEGAMUS Transitional Reader and A Caesar Workbook. "Academic Conversations in the Latin Classroom" Marianthe Colakis (Townsend Harris High School, Flushing, NY), author: Lectiones Memorabiles: Volume I: Selections from Catullus, Cicero, Livy, Ovid, Propertius, Tibullus, and Vergil; coauthor: Classical Mythology & More: A Reader Workbook, Excelability in Advanced Latin: A Workbook for Students, and (forthcoming) Lectiones Memorabiles: Volume III: Selections from Caesar, Catullus, Horace, Livy, Ovid, and Vergil. Bolchazy-Carducci Publishers provides eTextbooks on a variety of eBook platforms. Bolchazy-Carducci textbooks are available through VitalSource, GooglePlay, Chegg, RedShelf, Adams Book, Follett, MBSDirect Digital, and ESCO. Each eBook platform offers a variety of tools to enhance the learning process. eBooks have the same content as our traditional books in print. eBooks are purchased from the eBook provider. 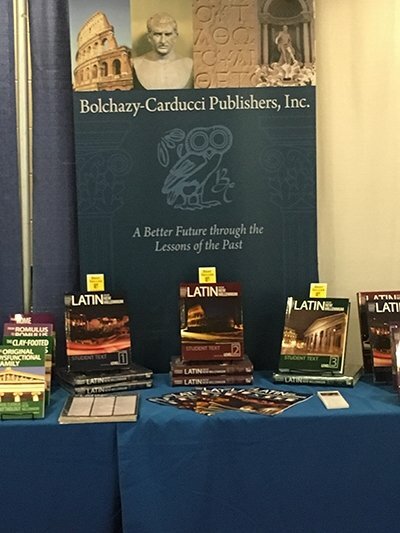 For direct links to purchase Bolchazy-Carducci eTextbooks, visit the title's product page on Bolchazy.com. Just above the product description there is a list of the eTextbook providers and a direct link to purchase the eTextbook. Some eBook providers sell directly to schools—check with your school to make these purchases. The eyeVocab software leverages human memory for distinctive affective images* presented in isolation to radically improve the speed, depth, and permanence of second language vocabulary acquisition. Images are drawn from classical art, both western and eastern, from photojournalism and historical photography, great book illustration, and other sources. *Learn how images are chosen. Far more than a set of electronic flashcards, the multimodal vocabulary program facilitates a significantly deeper learning and retention. Students will readily master the frequent Vergil and Caesar vocabulary for the AP® Latin Exam and thereby devote far more of their study time and energy to reading and discussing De Bello Gallico and the Aeneid. eyeVocab programs correspond to the following B-C books. Introductory rate for each of the AP® Latin programs is $14.95. The LNM 1 and LNM 2 introductory rate is $24.95 per program. For site licenses, contact Miles Becker at sales@eyeVocab.com. Click on each title to learn more. Bolchazy-Carducci Publishers has partnered with gWhiz Mobile LLC to develop Latin vocabulary apps for iPhone, iPad, and iPod touch. 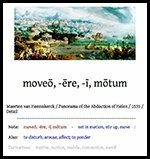 The apps correspond with the vocabulary in Vergil's Aeneid Selected Readings from Books 1, 2, 4, and 6, Caesar Selections from his Commentarii De Bello Gallico, Latin for the New Millennium Level 1, and Latin for the New Millennium Level 2. Each app offers a free sample of ten words to try before you buy with an in app purchase option of $9.99. Click the links above to download the apps. Each September, Bolchazy-Carducci mails its Roman Calendar to Latin teachers across the nation. If you're not on that mailing list, send a note TODAY to info@bolchazy.com. Put Roman Calendar in the subject line and provide us the USPS address to which you wish the calendar to be sent. The calendar is also available in a digital format. Preview Bolchazy-Carducci titles before you purchase using Google Preview. iPodius - Bolchazy-Carducci Publishers online shop for: audio, software, video, and a treasure trove of teacher-created materials in the Agora. Become a FAN of Bolchazy-Carducci Publishers, visit our Facebook Fan page for the latest news from BCP. Visit the BCPublishers Blog for B-C news and information. Check out the results of this year's Martia Dementia. Congratulations to Nicholas Santana of St. Ignatius College Prep in Chicago who took first place! These products have been developed independently from and are not endorsed by the International Baccalaureate (IB). The calendar notes that summer officially arrives in a few days but Chicago's wacky weather is more like October's! With summer's arrival, Bridget Dean, Laurel Draper, and I look forward to greeting our colleagues at the University of Montana in Missoula for the 74th Annual Institute of the American Classical League. We also look forward to a "Big Sky State" experience. See you there! Be sure to check out Lynne West's "Tech Tip" in this issue. She had previously written about GooseChase in the January eLitterae and included the program in her recent B-C webinar. Based on that presentation, our eLearning manager, Jody Cull, suggested we ask Lynne to construct a GooseChase for sharing, and so we have an end of Latin 1 review GooseChase in this issue. Your students are sure to find it a fun learning activity. 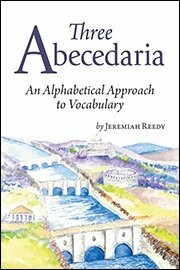 This month's discount special is for our latest title Three Abecedaria by Jeremiah Reedy. This book is a great treat for all your logophile friends, for your own summer reading, and as a graduation gift. All of us at Bolchazy-Carducci Publishers wish you and your students a safe, relaxing, and rejuvenating summer. Be sure to make that summer "to do" list a doable one! Customize it in any way you wish. I think it's more fun to have some of the GPS-based missions too, but you'll have to add those in yourself. Print out the reading on Pan from the chapter 16–18 review section of the student textbook. Pre-create up to five team names and set no access codes for the teams. Instruct students to download the GooseChase iOS app to an iPhone or iPad. 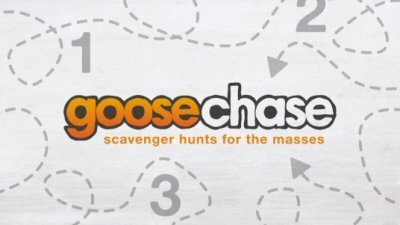 On scavenger hunt day, assign students into teams and tell them to search for the game by name from the GooseChase app. They will be prompted to create a free account and join one of the pre-created teams. Each team will need one iOS device with GooseChase loaded, a few sheets of paper, and a couple of pens or pencils. To start the game, click the start/stop link and set the game timer to your desired duration. I think somewhere around 20 minutes is about right for the missions as written. Tell the team that they have 20 minutes to earn as many points as possible and hit the start button. I hope you all enjoy it! While this GooseChase set of missions is aligned with Latin for the New Millennium, Level 1, teachers will note it's easily used with another beginning text or adjusted for another text. Please find a copy of the Pan and Syrinx story from Latin for the New Millennium, Level 1, for your classroom use only. This story, as downloaded by the eLitterae subscriber, is not to be otherwise copied or distributed. Ms. West's monthly column will be on hiatus July and August but will return in September. May for Bolchazy-Carducci Publishers means a road trip to Michigan for the annual Congress on Medieval Studies hosted by Western Michigan University in Kalamazoo, MI. Editor Laurel Draper represented B-C at the 53rd Congress held May 9–13, 2018. The book exhibit showcases the Latin for the New Millennium program. Traffic to the booth was down from previous years, perhaps due to rainy and cold weather for much of the conference. The Other Middle Ages and Ubi Fera Sunt received a lot of attention and sold well. A reporter from the local magazine Encore Kalamazoo noticed Ubi Fera Sunt and stopped by with some questions about the book. 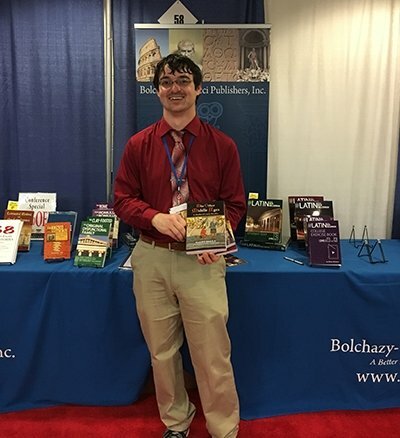 Matthew Hilferding, a student at Western Michigan University, won the fishbowl drawing for a book bundle that included The Other Middle Ages, The Vulgate of Mark with the Synoptic Parallels, and Ecclesiastical, Medieval, and Neo-Latin Sentences. Matthew Hilferding displays his winnings. As usual, the kiddie books and buttons sold well and drew people to the booth. Our exhibit neighbors this year were students promoting the Mostly Medieval Theatre Festival, a biennial event that stages plays and music from the Middle Ages. Hrotswitha of Gandersheim's Dulcitius was among the recordings from last year that were played to draw interest for the event. B-C has published two Hrotswitha titles: The Plays of Hrotswitha of Gandersheim: Bilingual Edition and The Plays of Hrotswitha of Gandersheim. For those teaching AP Latin, novice or veteran, the College Board offers a set of institutes from Texas to Maine. Master teachers include Bob Cape, Donald Connor, Jill Crooker, Keely Lake, and Mary Pendergraft. These AP Latin Summer Institutes and Workshops are an excellent investment of a teacher's time. Lynne West, who pens eLitterae's monthly "Tech Tip," will again offer a workshop called "Simple Strategies for Technology Integration" at the Taft School's Education Center in Watertown, Connecticut. The workshop runs from July 23 to July 27 and will provide lots of opportunities to both learn about great tools and practice using them. For more information, visit the website; in the disciplines window, choose "Technology," and place a check in the E-week box. The New York Times and Smithsonian weigh in on a skeleton discovery. The longevity of the Mediterranean diet. 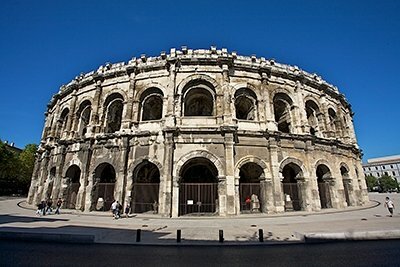 Nimes celebrates its Roman heritage. The Roman amphitheatre in Nimes, France. Courtesy of Jan Hazevoet/Creative Commons 3.0. “Hidden Figures” from a classics perspective. Classical echoes in Cormac McCarthy's work. on products distributed by Bolchazy-Carducci Publishers. (Please note that there will be no adjustments on previous purchases. Enter coupon code eLit0618 on the payment page. 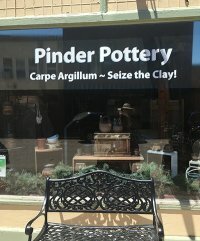 The special offer pricing will be charged at checkout. Enjoy Summer!! Webinars will resume in September. For the 2018–2019 line up, check back here mid-August and the August issue of eLitterae. Please note: The Bolchazy-Carducci Publishers Webinar Program is intended to be a live interactive endeavor in which presenter and attendees ask questions, make comments, seek clarification, share examples, etc. Thus, by design and in order to protect the presenter’s intellectual property, B-C does not make recordings available to non-attendees. B-C encourages those interested in a given topic or presenter to plan to attend the live webinar. If you have suggestions for Fall 2018, please contact Don Sprague. What Equipment Do I Need for B-C Webinars? To participate in Bolchazy-Carducci Publisher sponsored webinars you will need high-speed internet access, computer speakers/headphones, current web browser, and the link to the webinar virtual meeting space, which is provided in your webinar invitation. Participation is free. All webinars provide opportunity for participants to ask questions. Learn lots—attend as many presentations as you can. Bolchazy-Carducci Publishers provides documentation for your participation. You can share this with your supervisors. Many webinar presenters provide handouts, etc.